50 years after the launch of Citroën Méhari and 2 years since the launch of Citroën E-MEHARI, this all electric 4x4 convertible remains a symbol of boldness and the daring nature of the Citroën brand. For its birthday, Citroën calls upon the creator Jean-Charles de Castelbajac to design an exclusive E-MEHARI Art Car that symbolises strength, vibrancy and innovation to reflect celebrating 50 years of freedom and 50 years of creativity. 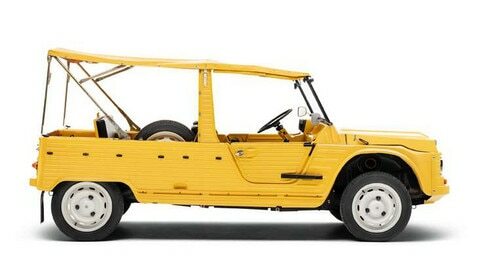 May 1968 marks the birth of both Citroën Méhari and Jean-Charles de Castelbajac. May 2018 brings the two together in a collaboration to form a creative revolution which animates Citroën and the artist. Citroën has encapsulated boldness and creativity since 1919 and brings a breath of fresh air to the automotive landscape. Jean-Charles de Castelbajac is an innovative creator, who has pioneered the relationship between art and fashion with his creations. 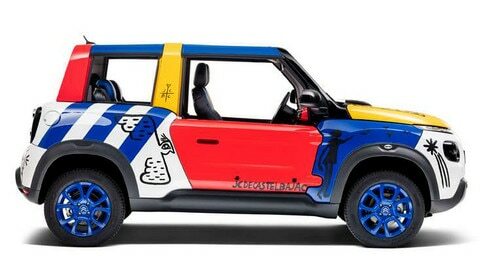 The result of this partnership is an E-MEHARI Art Car, an emblem of French lifestyle - optimistic and vibrant - the Art Car created by Jean-Charles de Castelbajac awakens the creative spirits and illustrates his two passions: art and fashion. Citroën revealed the Méhari on May 11th, 1968. It was a model ahead of its time, designed with leisure, simplicity and fun at its heart. Characterised by its colourful plastic body. As a 4x4 convertible it offered great modularity and versatility which in turn has made it a true icon over the years. Its adaptability made it an effective vehicle for the French military, ranger vehicles in South America and beach/pleasure tour vehicles in Hawaii and California. In December 2015, Citroën revealed Citroën E-MEHARI: an all electric 4x4 convertible. It embodies the brands desire to be different, but also feel good with its consideration of the environment. In January 2018, Citroën added an E-MEHARI hard top allowing the model to become a 4x4 all electric convertible, it also underwent an interior overhaul in order to bring it up to date with new safety standards and integrate a more comfortable modern feel. FROM MAY 68… E-MEHARI IN 2018! More than a myth, Citroën E-MEHARI is a revolutionary model, that Jean-Charles de Castelbajac has defined with a play on colour, role and words. This artistic approach is described as a free Art. Its inspiration comes from May 1968 and takes you on a journey of desire for changing the world. The colours are symbolic - red for passion, yellow for sunshine and brightness, blue for purity and ecology.